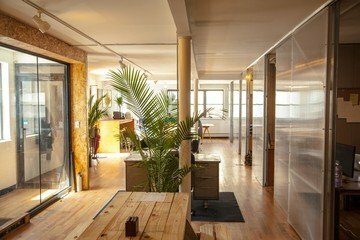 When stumbling across this bright and warm workshop space for rent in Williamsburg, you may feel as though you’ve found an oasis. 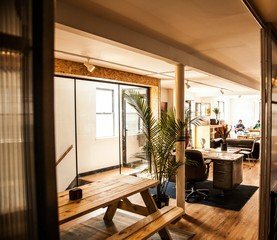 The abundance of natural materials used in this luminous coworking space is sure to make you feel comfortable and refreshed. The open space has gorgeous wood accents that give the room an inviting atmosphere. 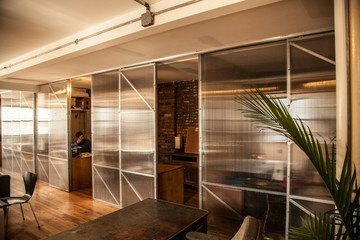 Paired with the cool but spontaneous decor, this professional NYC workshop space is sure to keep you relaxed but focused. 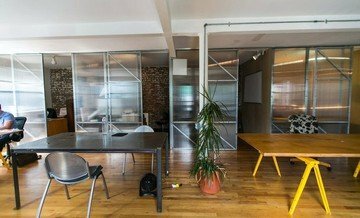 When looking to rent a venue for an offsite meeting, this well-designed office has beautiful modern design that will impress you and your colleagues! Renting a workshop space in Williamsburg isn’t always a sure bet. Luckily, our scouts have checked out this sunny space and can assure you that this is the perfect stylish space to host your next event. Whether you’re searching to rent a space for an offsite meeting, seminar, training session or a creative workshop, this bright room is more than able to accommodate you! This pleasant workshop space for rent in Williamsburg can host up to 250 people and can also function as an event space. 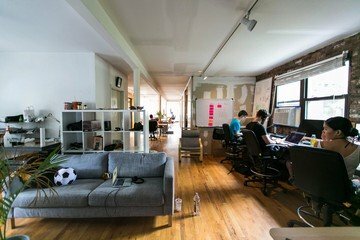 Young companies, start-ups, and creative groups looking for inspiring spaces will really enjoy renting this offsite venue. This trendy space comes technologically equipped with a projector and screen, a whiteboard, a music system, a TV screen, water and coffee/tea free of charge. If needed, lunch can be catered at this space for an additional fee per person and a flipchart is also available for a small charge. 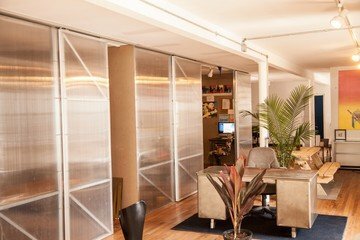 If you rent this workshop space in NYC, you’ll find it very easily reachable and well located. It is just a stone’s throw away from the L and the G train, and takes just 5 minutes to reach from Lower Manhattan. The hip area is complete with restaurants and bars for you to visit, as well as hotels closeby for any travelling colleagues (such as the City View Hotel). This renovated neighborhood is both residential and commercial and not lacking in artistic flair, either; you’re sure to enjoy a successful and creative meeting with your colleagues here.